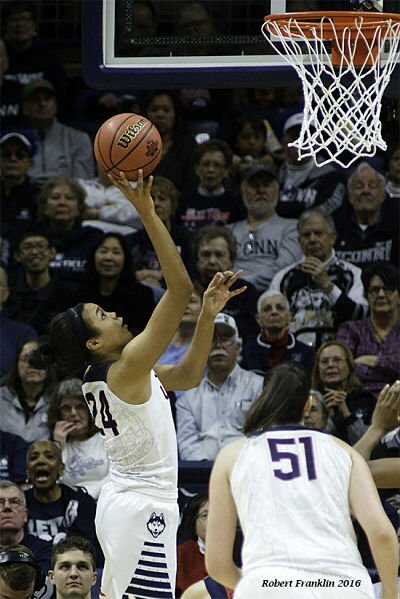 Saturday, March 26, Webster Bank Arena- Bridgeport, Conn.
Napheesa Collier puts it up and in. Photo by Robert Franklin. Well, you can’t say much about this one, other than it would be one of the great upsets in NCAA history if the Bulldogs defeat the Huskies. And it won’t happen. The Huskies, with Morgan Tuck apparently back in an offensive groove, are pretty much in sync offensively. The defense of the top six UConn players is the nation’s best. Mississippi State is the sort of quick team that may disrupt UConn for a while, but that UConn defense will simply make it too hard for the Bulldogs to score enough points to stay in the game. Mississippi State Sophomore Victoria Vivians is a star, but her 24 points against Michigan State required 22 shot attempts: another high-volume, low percentage scorer. UConn has historically shut down the best player on the other team, and nobody on Mississippi State’s roster has shown the ability to step up if Vivians has a bad day. Chinwe Okorie, the 6-5 junior center has had some strong performances this season, but will need to be dominant to give Mississippi State any chance of hanging around. The Bulldogs are also a poor three-point shooting team, so they will have trouble exploiting that chink in UConn’s defensive armor. UConn is shooting 54 percent from the field and exactly 50 percent from three in the tournament. They have held their two opponents to under 25 percent shooting in the first half, when the starters were on the floor. 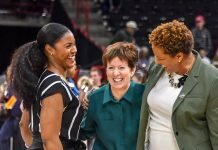 Breanna Stewart, Moriah Jefferson and Tuck are each averaging nearly 18 points a game while playing just 28 minutes per game. Jefferson is 8-11 from beyond the arc. They are playing almost at home. They have won 71 games in a row, and 117 of the last 118. UConn should move on with the ease they have shown all season to face a much more challenging Texas team in the Elite 8. Imani Boyette blocks a shot. Photo courtesy of Texas Athletics. Texas has lost only one game to a team other than Baylor, the 35-1 #1 Seed in the Dallas Region. They have cruised their way to the Sweet Sixteen. 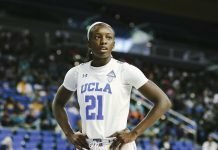 UCLA has one of the youngest teams in the tournament, and has struggled to advance. 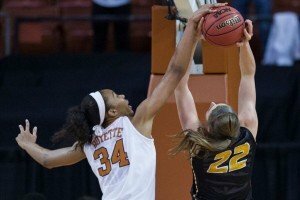 Lots of tall in this game: Texas has five players 6-3 or taller, led by senior Imani Boyette (11.3 ppg, 9.0 rpg), while UCLA has four players over 6-3, led by Monique Billings. 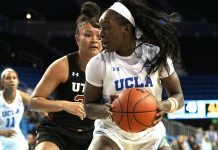 Oddly, that may mean that this game will be decided in the backcourt, by Texas sophomore Brooke McCarty (11.6 ppg) , and UCLA sophomore Jordan Canada (15.9 ppg), who lead their teams in scoring. McCarty is by far the better outside shooter (.409), while Canada gets into the paint and to the free throw line more often. They are really the players to watch. Both teams have been challenged by quality conference opponents, and have played with tenacity and success. Their stat sheets are statistically identical in nearly every category. Texas has greater depth and may be the better defensive team. Neither turns the ball over excessively, but neither has a positive assists/turnover ratio. Texas should prevail in a very competitive game based on experience and depth.